The family of Traralgon Police First Constable Matt Foki have been “overwhelmed” by community support following his unexpected death. The 39 year-old died on 16 September to an unknown cause, with investigations still ongoing. More than $27,000 has been donated to his wife and two sons, three and nine years old, via a ‘My Cause’ page. Funds will provide ongoing support as well as financial assistance to his New Zealand relatives to attend a funeral in Morwell tomorrow. 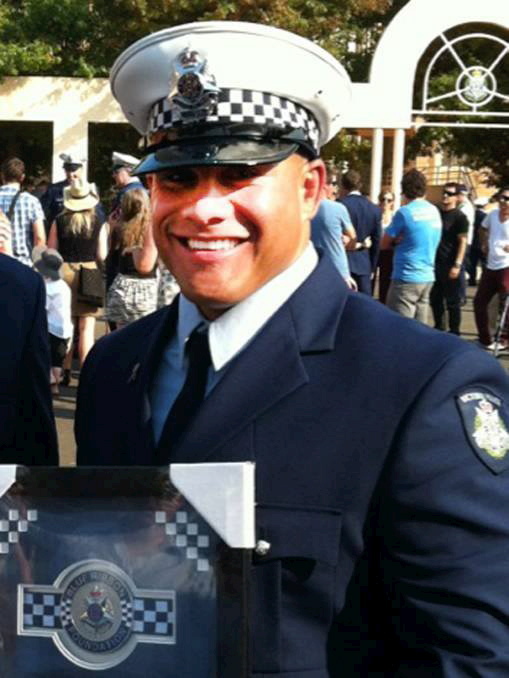 Constable Foki started at Traralgon police in April 2012 and was made a constable in 2013. His brother Dave Foki on the ‘My Cause’ page said: “Matt would probably shy away from all of the attention and love being directed his way right now. “But there are so many who want to show our love and support for his family, we wanted to make this as easy as possible,” Dave said. His sister-in-law, who wished not to be named, said on behalf of the family they were overwhelmed by the support and the community’s stories shared about Matt. “It’s amazing the impact he had on the people he met. He was pretty special to a lot of people,” she said. Traralgon Police Sergeant Brent Muir, who will be among 200 members to attend the police funeral including a guard of honour, said Matt was highly regarded among his peers and the community. Sergeant Muir said the station was mourning the fit, strong and happy man that everyone wanted to work with. “His peers felt safe working with him and he spoke to people well. He was always happy, with a big smile on his face,” he said. Matt Foki’s service will be held from 2pm at Kernot Hall in Morwell tomorrow. Hundreds of Latrobe Valley locals are expected to turn out to farewell Traralgon police officer Matt Foki, following his shock death. Investigations are still underway into the death of the 39-year-old Constable, who died on September 16th from an unknown cause. Constable Foki’s family say they’ve been overwhelmed by the support they’ve received, with generous people chipping in $27,000 to help his young family via a ‘My Cause’ page. He has left behind a wife and two sons, aged three and nine. Donations have also helped his relatives from New Zealand fly out to his funeral in Morwell this afternoon. His funeral is at Kernot Hall from 2pm. Constable Foki started with Traralgon police in April 2012, and was made a constable in 2013. Morwell Sergeant Jeff Robertson said most officers planned to attend the funeral. Hundreds of locals and police officers packed Kernot Hall today for the funeral of Traralgon Constable Matt Foki, who died suddenly in his sleep last month. Morwell Sergeant Graham Maiden said the 39-year-old was wonderful, and fiercely loyal.